Yay, we go to Paris tomorrow! Finally we can go together on holidays, the last time we went anywhere (if you don’t count Hong Kong in December, since Sing still had to work over the phone/computer) was in May 2014. It’s a really spontaneous trip, we were eating a meal together and I said ‘Let’s go to Dublin next weekend, have some dim sum and bubble tea’. And by the time we went back home, we decided to go on a 4 days trip to France. I got so excited, I had to share that news with you guys. At that point I was warned exactly 7 times to watch out for my belongings and scam artists. To be honest with you, I’m that sucker who would probably go for it. Have a poor guy, give him a dog and I can give my wallet to him. Luckily, Sing is more rational than I am. And it all dates back to the first time we went together to Asia. We planned to visit Hong Kong, Thailand, China and Singapore so he kept showing me videos or informing me how foreigners fall for scams. Luckily, besides two of them, we did not experience any other scams and we didn’t lose any money or limbs, which was nice. 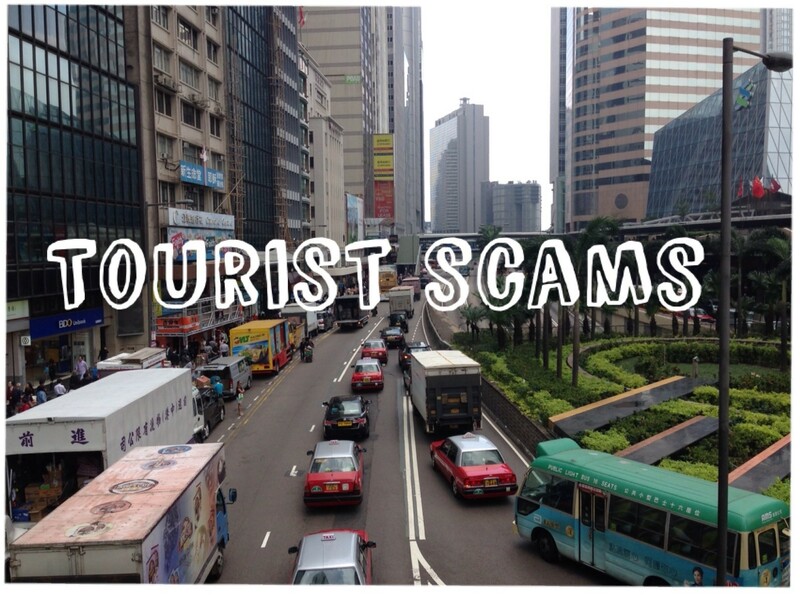 So to help you to not be THAT tourist we gathered the most common scams and hopefully non of you will ever have to face, any of them. First I heard of them from my husband, then I was approached by them close to Ten Thousand Buddhas Monastery (萬佛寺) in Hong Kong. I was later informed that it happens all around the world. The most ironic thing is, the ‘monk’ approached me, my husband pulled me away from him and 100m later showed me a sign saying that real monks don’t ask for money. So when I saw them in San Francisco, near Chinatown, I wasn’t scared to warn approached people. 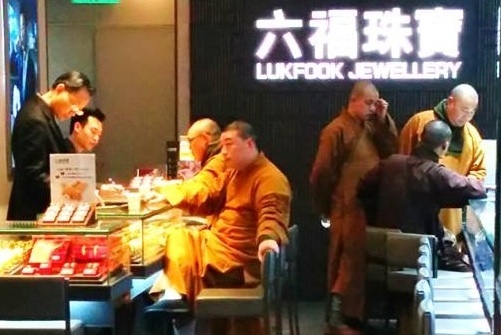 You can also check out Facebook page called ‘Fake monks in Hong Kong’ (click here). I guess his harsh realism saved him some money. Sing was terrified when we drove in Thailand, since there was a white foreigner in the car (hard to guess who that was) and it just screamed with ‘Scam us’. Luckily no one approached us, but we heard stories of people stopped by a fake policeman, he or she will ask you for your documents and pretend there’s something wrong with them and won’t give you them back. Then they say that if you pay them, they will let you and your documents go. 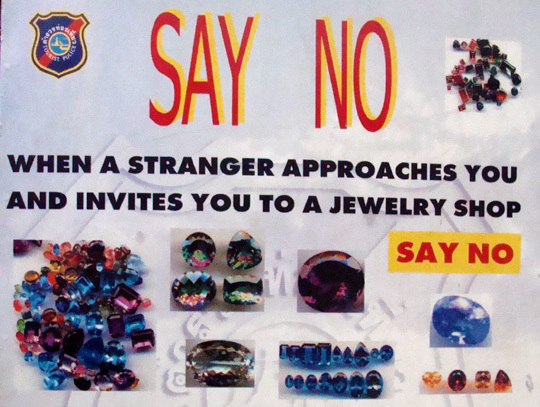 Sadly, I don’t know how you can avoid it, I guess the best thing you can do is check online the police badges of the country you visit and when approached by a policeman, you just ask to show the badge first. Similar to online scam from ‘American soldier who found gold in Iraq‘. Locals will befriend you, then they will tell you about great investment opportunity with cargo full of precious gems that are worth so much money, when they are sold in foreign countries. But poor local person cannot afford to pay taxes and shipping… you can figure out the rest of the story. DON’T GIVE ANY MONEY, IGNORE THE REQUESTS, GO AWAY FROM A FAKE FRIEND. End of the story. I think this one would be popular in China, especially around people like my parents who want to ‘experience like locals’ (although my dad still think orange chicken is a real thing). It starts in a different ways, you might be approached by someone and invited directly to a tea house or as a ‘return of favor’ for taking a picture or something. You taste different samples, you might be forced to buy the one you liked the most, but in the end, even if you don’t buy anything, you will be left with a 500-700RMB bill. I don’t know if that’s really a scam, but I know it’s a thing in China. There are plenty of cheap travel tours, that end up in a jewelry shop or souvenir store and for some reason people agree to be to forced to buy something for ‘good price’. Momzilla was on one of those tours with Sing’s outside oldest cousin. She yelled to people that they shouldn’t buy it, it’s a ripoff etc. Guess who got kicked out of the tour? You don’t mess with Momzilla. This one is really disgusting and I’m still wondering how no one does anything about it. When you travel from Thailand to Cambodia, immigration officer says he or she won’t accept the 20 dollars official fee even if it’s clearly written on the office wall. They will try to make you lose your patience and just give them twice much. Our friend who has a Filipino wife says he always puts 10-20$ in his passport while crossing the boarder. I can understand all the scammers on the streets, but doing the same thing when you’re a government official? What the hell? Anyone experienced it? There are many, many types of scams. It’s so sad, but I hope this post will help you in avoiding most of them. I also found this great infographic with scams around the world, but I want to add to the ‘Friendship bracelet’ scam that it might turn much worse than just asking for money. I heard of version that they put it on your finger then few men appear and force you to go to the nearest ATM and withdraw money for them. Please be careful everyone! My first weekend living in China, I was approached by the Tea House scam, but I knew something was wrong when the girl spoke better English than anyone I had met up to then! that’s a good advice how to spot a potential scammer! 🙂 good you didn’t lose any money like that! Er, sitting in the deck chairs in the London parks is not a scam. It’s very well known you pay to sit in them, which is obviosuly why you are given a receipt. If you don’t want to pay, simply don’t sit in them! Gosh I think I will stay home! I will travel through your eyes! Thank you for the list! Super helpful! The expensive taxi driver thing actually happened to me in HK. Just got back from Disneyland line and due to the exit it was easier to get the taxi to see the Promenade light show at the harbour – all the time I had Maps on and was tracking the location… instead of just going straight down he took the long scenic route 😦 Only was a few dollars more, but still annoying. What about the “art student” scam? In tourist areas in China you’ll be invited to a student art show but it’s really just a trick to get you to buy some terrible art. We also had a police officer try to get us to pay a fake traffic fine on the spot in Indonesia. 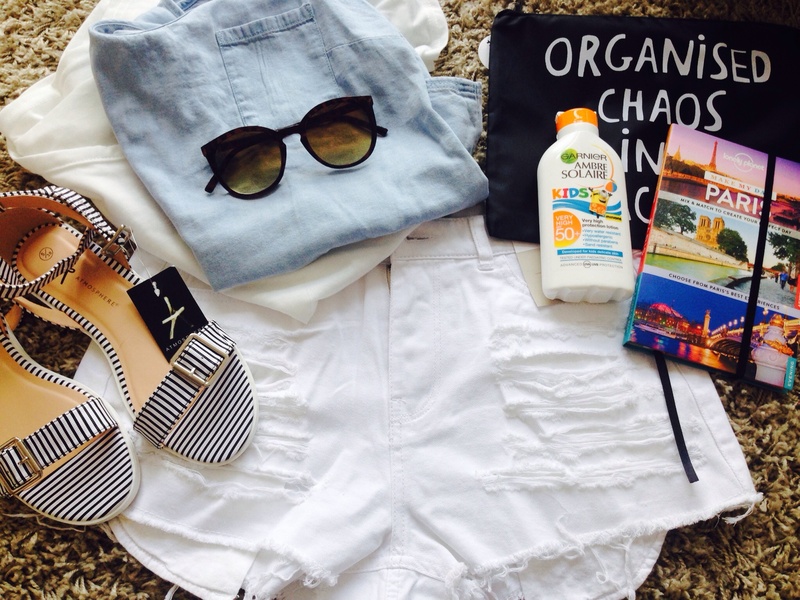 Are you sure you want to go to France?! It seems very dangerous at the moment.. they just had a UberPop riot yesterday, and today, one person was beheaded by a terror attack. I feel like it’s not safe to go there (at least, not right now). Please be careful. Thanks for a very helpful post. Had some experiences with Tea Ceremony gangs in Shanghai! hopefully you haven’t lost any money! No. We had done out homework. It was sad however as everyone that was engaged in the scam was young with perfect English. They could be applying that knowledge and skill to some better endeavour! Very helpful post. The immigration scams one in particular are very worrying…I know the putting the money in the passport thing happened in Malaysia and Indonesia about ten years ago. Happened when i was still very young traveling with the parents but today, not sure. Scary. that’s what I don’t get – I can understand scamming on the street but at the immigration? that’s just shameless! That’s a good round up of scams. There are quite a few in Thailand. You just got to stay aware and not flash your money around is best. Stay away from dodgy areas and stay safe as with all countries. I still feel a lot safer living in HK but still wary of my belongs all the time, ‘coz you never know. You know, the fake police scam, most of the time they’re not fake, they’re real police. Usually they just want a bribe, so they’ll fabricate some non-existent offence and hope that you will be gullible enough to fall for it. For me, I will usually request to see their ID is genuine or not, then I’ll just insist him to write me the ticket. If the offense is fabricated, they usually won’t do it because I can then take that ticket to the courts and challenge it. For you guys though, the foreigners, it is best to research how genuine police ID looks like in the country you are visiting, or worse comes to worse, if you are worried about the police being real or fake, you can always request to follow the police by car to the nearest police station to settle this. I’ve had friends caught out by the tea ceremony scam – it’s tricky because whilst you have to be cautious, and as a tourist you are a prime target, you don’t want to be travelling through a country suspicious of everyone in it. Apparently a good way to gauge if a friendly local who invites you for tea or drinks may be scamming you is to suggest hanging out together elsewhere – because if it’s a scam they’ll be really resistant and try really had to get you to go to one specific place. With the inforgraphic, many of the scams, not listed for Barcelona, happen in Barcelona. Always ask someone to watch your belongings while you go for a dip in the sea (they operate in pairs. The guy notices bags unattended, a girl casually goes through them) and never sign or donate to charities unless they’re wearing a charity bib and charity ID (In Parc Ciutadella, there’s a groups where girls ask for money or a donation and then note where you put the wallet/purse back in back pocket or bag, call the guys who pick pocket later.). Always, always watch your belongings wherever you are! Anyways, have a great time in Paris my dear! Thanks for the scam alerts! Can never be too careful when traveling. This is an interesting and informative bit of advice for anyone travelling here. The shopping scams are definitely very common here in China. A friend of mine experienced this with her family on a tour group to Hong Kong. They were taken to a jewelers and told they had to spend at least 5000 RMB each or they would be kicked off the tour. In the mainland nothing is done about these scams and they are especially common in Yunnan, but in Hong Kong it is not legal. I read a story the same week that Helen was on the tour of Hong Kong about someone who called the police on such a scam group. The tour guide was arrested and the tour group was still forced to take the tourists to the places promised. It is extortion, it is illegal and it is possible to call the tour operators bluff. I live near SF and the fake monk thing totally happened to me! I ended up speaking in Chinese with them to figure out what they wanted, but they were really forceful. They slipped some bracelets on me and my friends hands (we thought they were free gifts at first) but then they wouldn’t let go, and kept saying “sign this” all smiley and told us a sob story about needing to rebuild some house, eventually we got away. Nice post dear 😉 I think as foreigners in Asian we get approached a lot by locals just curious about us and what we’re doing there that we forget there are con-artist in every country, not everyone is just trying to be friendly. I bought a fake product in HK once. It was so cheap and obviously fake, I don’t know why I even bought… So when I went back to the store to give it back the store was already closed. So I want there the next day and guess what? I found the guy who sold it to me and he remembered. Of course he didn’t want to take it back, but I started to scream. 10 seconds and many interested passerbys who came to look later, I got my money back, and he his crap. Hi there. Ur tips are very useful! Thanks for sharing. I hope they are! 🙂 Don’t want people to lose their money in such a stupid way!